Recently I got to watch again the film classic, “E.T. the Extra-Terrestrial”. This was the second time I saw it – the first time was during its original theatrical release in Poland. That was probably in late 1983 – in the U.S. it was released in 1982 (back then, there was a long delay before American movies made it to – then communist – Poland). So, it was very interesting to look at the movie again after so many years. Having seen it as a child, I had only a scant recollection of the movie. In terms of the plot, I only remembered the beginning and ending (and watching the film now, I realized that I missed a good part of the beginning – we must have arrived late. Super long line-ups for hit American movies were the norm in Poland in those days). Mainly, I remembered how the movie made me feel (which I guess makes sense since our memory is much better at storing emotions than facts). Having watched the film again, I am even less surprised that I remembered how it made me feel. I think the main reason for the movie’s success – it had the biggest box office until another of Spielberg‘s movies, “Jurassic Park” (1993) – was the emotions that it stirred up in the audiences. The film is fun, has memorable images (including the iconic image in the poster above), but most importantly, it presents characters and situations that are easy for people to respond to. Perhaps many people who went to see the movie did not expect to be emotionally moved – when you think about sci-fi, alien movies, you don’t think of tear-jerkers. So, that probably played to the film’s benefit – if you go to see a film that you know is supposed to be melodramatic, you are more resistant to let your emotions come out. On the other hand, it’s not surprising that executives at Columbia Pictures turned Spielberg down when he approached them, as the first studio, to produce the E.T. They must have right away compared it to other sci-fi movies. It is a safe guess that they saw the “Star Wars” as the model of a successful sci-fi movie. Of course, these two stories feel so much different. It is a great example of the fallacy that studio executives are often guilty of when judging the potential of a film project. They want films that are similar to films successful in the past, but great films are unique, so this type of analysis can only lead to mediocrity. It was a unique approach to have an alien who was friendly, rather than strange and dangerous. E.T. was also far from cute. As Spielberg said it, E.T. was “something that only a mother could love”. Certainly, the mantra in Hollywood is to create cute, lovable characters, so that the audiences respond to them, but also for merchandising reasons (that is probably the primary reason). So, Carlo Rambaldi, the designer of E.T., cannot be accused of taking safe options. As I watched the film now, it also stood out to me that many of the shots were very long. This made me realize how used I have gotten to quick editing. I wish more films tried slower editing. I think the audience gets absorbed more when they see shots where their eyes can wander around the frame (as the characters, elements move) and they can anticipate what will happen next. By cutting a lot, especially to close-ups, there is little room for interpretation and anticipation – the audience is very clearly told what to focus on. In the final scene of the movie, (spoiler alert – for the younger generation who might want to see whether there was anything good before “The Avengers”) as the kids see E.T. off, the shots were, again, long. That was also the most impactful, emotional scene of the movie and I think the editing choices, the framing of the shots, had something to do with it. The dialogue was also kept simple – there were no memorable, catchy lines. I think this approach of few embellishments added to the sincerity of the scene and made it more effective. I would say that only the music played strong, but the beautiful theme composed by John Williams was a masterpiece (as was the whole score, which won him the Oscar). It is also worthwhile to point out that the long shots did not result in a slow pace of the movie. Certainly, the story moved along very well. So, no filmmaker should have fears that long shots would make his or her films play slow. I also noticed that Spielberg took some liberties with… reality, I guess, to create fun, memorable images. For example, it’s middle of the day when the kids are on their bicycles and are pursued by the police. But soon after they fly off, they pass by a big red sun, and then they land in the forest, already at dusk. For whatever reason the chase sequence was not shot at sunset, which would have made the time transitions more believable. Nevertheless, Spielberg pushed the credulity of the audience in order to create that beautiful image of the kids on bicycles flying past the sun (the shot of Elliott and E.T. flying by the moon comes earlier in the movie). There were a few moments like that in the movie where credulity was stretched for the sake of fun and memorable images. Now, since I and millions of other viewers loved or liked the movie, the conclusion must be that Spielberg made the right choices. So, this is one of the skills he has as a director – to know what one can get away with, how much one can bend the reality (as it is presented in the story), in order to to create fun, memorable moments. 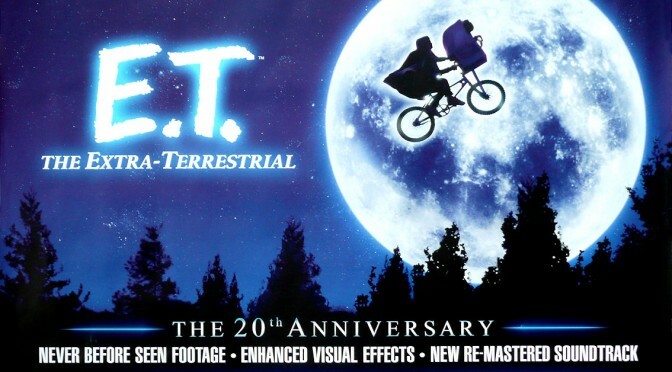 The last element of the movie that I want to touch upon are the visual effects – for which E.T. won an Oscar. First thought, the visual effects have really advanced. I am specifically referring to the shots of the spaceship taking off and landing; the light coming off the spaceship and lighting the kids waiting below ; and the shots of the kids on the bicycles flying above the city. I don’t want to take anything away from what these talented artists were able to create with 1982 technology, but what you see now on YouTube from independent filmmakers is comparable, or sometimes even better. Of course, this is as statement about technological advances, not people’s talents. And my second thought was, were the visual effects more convincing when I saw them in 1983? Did they seem real to me back then? Or was I impressed by them only because I had not seen something similar? And also, in twenty years, will I be critical of effects that look completely convincing to me today? Well, that is the fun part about retrospection. With the passage of time, we perceive things differently. But regardless of whether it was 1983 or 2016, I loved the film and I strongly recommend it to everyone – whether it will be your first time watching it or not. To find out more about the history of this movie, please read this comprehensive Wikipedia article.